Vangelis can glow in the dark and is not allowed near airports after 6pm in order to avoid distracting planes. For those without comedic tastes, the self-proclaimed experts at Wikipedia think they have an article about Vangelis. Vangelis is an analogue Greek rock musician with metaphysical tendencies who makes all these whooshing sounds for a living when some of us have to work in bakeries. Vangelis was a child prodigy, but he soon slimmed down after switching to a fruit diet. By the age of four he had already made a Balalaika from Lego. By five, he had wired it up to a battery so that it could be used as a rudimentary torch. Finally, at the age of 6, he escaped from the wardrobe. All of his classmates applauded. "...this music, it flows through me, like a kind of slippery jelly from heaven. I am merely a conduit, a kind of big hairy tool. 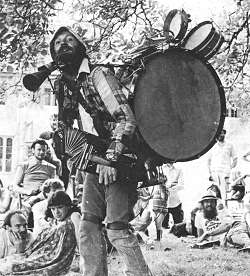 I am just a plastic funnel connected to a Moog..."
Vangelis was born on the Greek island of Delphi in 1957. 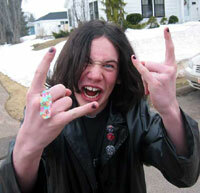 On the day of his birth, as is told in Greek legend, a goat emitted a short series of bleeping sounds. His parents (VanTransit and VanWhite) recognised this as an omen and set him up at once for a future in goat Morse telegraphy, which was the most modern form of communication at the time. Instead of sending messages from hilltop to hilltop, however, the young Vangelis simply herded the goats together and made them into a piano. Upon realising the true nature of their fat child's destiny, his parents enrolled him in the Athens School of Aerial, Airy, Celestial, Dainty, Divine, Empyreal, Empyrean, Exquisite, Fairy, Filmy, Fine, Gaseous, Ghostly, Gossamer, Heavenly, Impalpable, Insubstantial, Intangible, Light, Rarefied, Refined, Spiritual, Sublime, Subtle, Supernal, Tenuous, Unearthly, Unsubstantial, Unworldly, Vaporous, Vapory and Vapid Soundtracks (known as ASAACDDEEEFFFGGGHIIILRRSSSSTUUUUVVVS for short) where he excelled. Vangelis Papapapa...pickupapangolin! 's first musical outings were with the band "Four Play", so called because of the four members. Vangelis doesn't like to talk about it much, because most people only have one and he considers himself a freak. And yet, some doctors claim that most men would kill for such a thing. "Four Play" was a sort of experimental rock symphonic space hopper ensemble kind of happening with loads and loads of the old spooky thrown in. Their first album "Long Hair and Beards" reached number 47 in the Greek pop charts. These were the charts that Vangelis Papapapapa?...Nichole? would write himself with a crayon. The album paved the way for "Long Hair, Beards and Scarfes" which was the band's breakthrough. Vangelis played the Moog, Prophet, Mufflewhump, Bimbo, Goat and Triangle on this album. Vangelis nearly became the keyboard player for the rock band "Yes" after he was approached by Jon Anderson with a request to join. Vangelis watched as Jon got closer and closer but just as they were about to meet, Jon just kind of floated away. It was beautiful, man. Jon returned however, a few years later, and convinced Vangelis that they should release an album as a duo, but the end result proved to be very unsuccessful. After making this mistake 3 more times, Vangelis became uncharacteristicly angry and sat on Jon, who hasn't been seen since. In 1981 Vangelis won an Oscar for his soundtrack to "Chariots of Fury" a British film about athletic young men all struggling together with little or nothing on in the Olympics. It is because of this score that Vangelis is now celebrated as having made the best ever piece of music to go with film of people running very slowly across a beach. Mozart, Beethoven and Bach have all had a try at it and all failed. It wasn't until Vangelis composed "Chariots of Fury" that the world got the music it deserved. The secret to his success in this field, according to Vangelis, was to actually compose his music while watching films of people running very slowly across a beach. Mozart, Beethoven and Bach were all very talented but none of them had TV, and it is more difficult than you might think to actually drag a piano onto a beach. Vangelis was so pleased with the results that he uses exactly the same visualising techniques for all his subsequent soundtrack recordings, even if the film doesn't have a single person in it who runs across a beach very slowly. In 1981, Vangelis was invited by director Ridley Scott to create the musical accompaniment to his new musical, "Blade Runner", a hilarious comedy set inside a public library in the Los Angeles of the future. Half the librarians turn out to be bionic and the other half have to chase them. 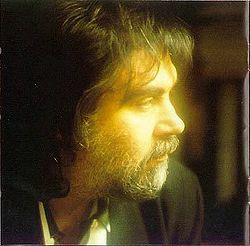 Vangelis produced an appropriately futuristic score which was well received by critics and radios. In 1986, however, he caused outrage among animal rights activists when he admitted in an interview to "Der Struming Monkey" magazine that he had killed a donkey while creating the score. The music opens with a deep booming sound, which actually is the sound of a donkey hitting the water at the bottom of a very deep well. Vangelis claimed that there was no other way to produce that precise sound. He claimed to have tried earthworms and lemurs but with little success. He also stated that back home in his village in Greece people killed donkeys for something as small as a traffic violation, while he was creating art that would be fed to the children of future generations for decades. Vangelis has always been appreciated by the scientific community for the way in which he distills all the soul from music via a tube and transforms the remaining sludge into mathematics. Dr. Carl Sagan was a big fan and used Vangelis' music in his series Cosmos. In recognition of how Vangelis made Carl so happy, NASA invited him to write the music for their 2001 Mars Odyssey Mission. As far as NASA was concerned, this was a win win situation, because even if the music turned out to be rubbish, no one would hear it in space. Vangelis did not disappoint. The music was, indeed, rubbish. Dispensing with his usual bank of electronic sonics, Vangelis opted for a new instrument he'd never tried before: women. The results were a warbling disaster, and the NASA mission capsule eventually decided to end it all by crashing into the surface of the planet. After all the scientists had gone home and stopped shouting at him, Vangelis turned his back on musical projects and now prefers to spend his days harvesting olives and rolling them down a nearby hill.